This edited volume examines how the transition and diffusion of power in global politics is impacting on stability and order in East and Southeast Asia. Both in the academic field of International Relations (IR) and among policymakers, the big question today concerns the rise of China, the relative decline of the United States, and the increasing importance of East Asia in global politics. The level of impact the international power transition will have in the region remains unclear, but observers agree that East and Southeast Asia a potential tinderbox for crises and conflict. This volume brings together leading scholars from around the world to assess current thinking in IR on these issues. 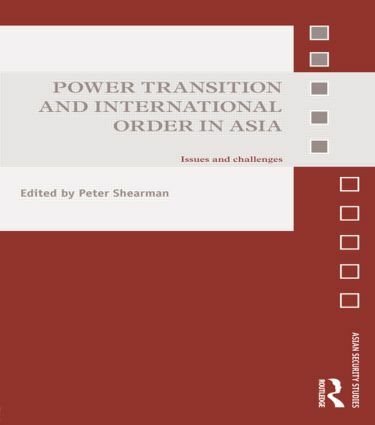 The authors apply appropriate theories and methods of analysis in their specific area of expertise to examine the likely effects of the changing global power distribution on East and Southeast Asia. There is also said to be an ongoing diffusion of power away from states to non-state actors in the region; hence, in addition to examining changing relations between the Great Powers, the book will also assess the implications that other actors, from terrorist groups, insurgents and organised crime syndicates, could have on stability and order. This book will be of much interest to students of Asian politics, security studies, diplomacy and international relations. Peter Shearman teaches at Webster University in Bangkok. He is also Senior Fellow at the Institute for Security and International Studies at Chulalongkorn University, Bangkok. He is editor/co-editor of five books.